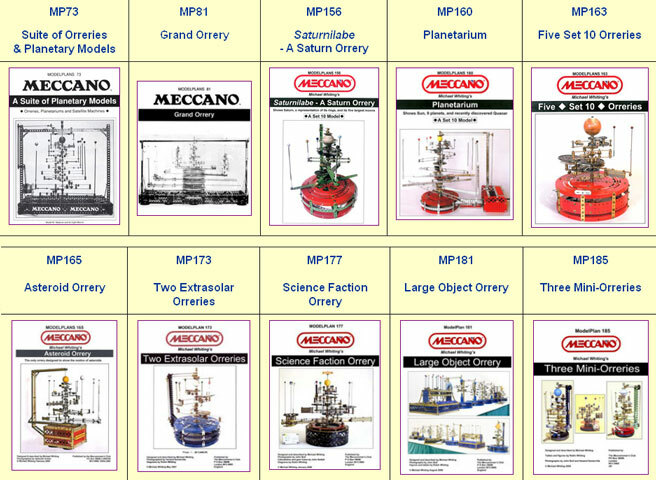 Michael Whiting's Orreries are acknowledged to be the definitive Meccano examples of these interesting mathematical astronomic demonstrations. Models of a large range of sizes and complexity represent our solar system, individual planets and moons and other large orbiting objects. Even two extra-solar planetary systems are included. Ten ModelPlans on one CD, with photographs, building instructions, background information, mathematical tables and diagrams scanned in high-resolution .PDF format which can be read on-screen or printed. For PC or Macintosh. Ref: MWO Price: £19.95.